This relatively new tourist gem from the wonderful province of Laguna has slowly but surely earned its turn to shine. 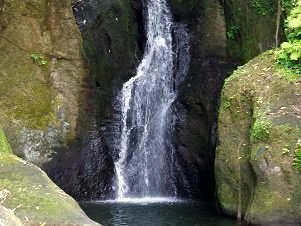 Located in the sleepy municipality of Luisiana, this day-trip will surely quench your thirst for a hike-and-swim adventure with not just one, not two, but THREE waterfalls: Talay, Hidden and Hulugan waterfalls. This place sure knows how to make a splash. TRIPinas created a package that is not just affordable but also practical. So if your idea of making most of your time is by combining land and water activities, then this one’s for you. Can't make up your mind whether you should go hiking or swimming instead? Our waterfalls circuit package is our answer to your adventure dilemma. What we offer is travel convenience at a friendly cost. Don't worry if you can't convince your entire barkada or family to go with you as we can arrange private trips with just a minimum of two people - you and your favorite travel partner. As with all trips provided by TRIPinas, we guarantee you a fun and safe outdoor activity, free from all the hassles of travel planning. The package covers your round-trip land transfer, a dedicated trek guide and all applicable fees. Get ready to get wet and dirty, these falls will not fail you. And hey if you feel like, we might even tell you where to get the best bibingka (local rice cakes topped with fresh coconut strips) in Luisiana - the best way to fuel up after a grueling day outside. Keep in mind that price depends on your group’s headcount. No extra fees to pay on site! After meeting your coordinator at the assigned pick-up point, you will board a private air-conditioned vehicle that will take you to the trail jump-off in Brgy, Salvador, Luisina, Laguna. You can have a quick pit-stop at the expressway to get your food/ water supplies for the day. Upon arriving at the site, you will meet your assigned tour guide. You may leave your change of clothes in the vehicle so your backpack for the trail is lighter. Take your food and water with you. Please see list of things to bring for guidance. Your warm-up will be a 15 minute walk on a paved road that leads to a tree line where your adventure begins. Caution must be exercised as the trail is littered with tree stumps and loose rocks. 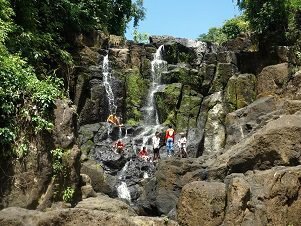 The first cascade you will visit is called Talay. It is the smallest of the three and is a good introduction to what the other falls have to offer. Continuing up, you will find what is aptly called Hidden falls. 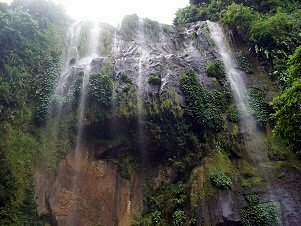 You can have a short break here, have a little snack before heading to the star of the show - Hulugan falls. You will retrace your steps until Talay falls and hike another 20-30 minutes. Be careful here as you will be walking over slick rocks; we have seen one too many visitors trip and sprain their ankle in this section. You want to enjoy your day and not spend it icing your foot. Although there are sturdy bamboo railings that you can hold on to, it will be a great idea to have a hiking stick/trek pole to help you navigate the muddy sections. We also discourage carrying bags with your hands. Opt for a small water-proof backpack or dry bag that you can wear across your body. The idea is your hands should be free so you can hold onto branches and boulders when traversing the slippery portions of the trail. Once you arrive at Hulugan, pick a spot, spread your picnic mat and pat yourself on the back for a job well done. Go ahead - reward yourself with a refreshingly cold swim and an early lunch. 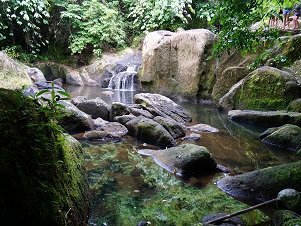 Explore the area with ropes to help you go up the rocky cascades and some improvised water buoys (salva vida) for those who wish to swim but don't know how. You can stay here for about an hour and then head back to the jump off where you can use freshen up. Before leaving for Manila, don't forget to try their local version of bibingka, a sweet ending to an adventure-packed day. Not familar with this destination? Check these to know how to prepare your trip. ❶ Where can we find Hulugan? Around three hours away from Metro Manila, Hulugan is located at Brgy. San Salvador in Luisiana, Laguna. ❷ How much time should I allot for the trip? To be safe, free your entire day for a comfortable adventure. We don't recommend that you book this trip if you are coming straight from a flight or will be flying out on the same day as the traffic in the metro can be heavy. ❸ How challenging is the hike? 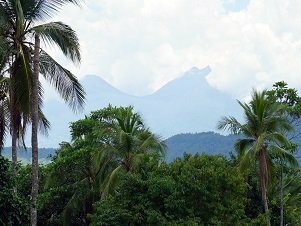 You will find yourself in a tropical jungle so prepare for humidity and insects. A sizable portion of the trail is muddy, you'll be crossing some streams and some rocky parts of the trail are slick especially those that are near the water falls. We recommend that you wear a pair of footwear that has a good ankle support and excellent traction (no flip-flops). ❹ Who should avoid this trip? For safety purposes, we won't accept pregnant women, kids under 8 years old and those who have knee and/or ankle issues. Everyone else is welcome. If you are not sure if this activity is for you, give us a call and we'll help you figure it out. ❺ When is it best to visit? It is accessible all year-round but it is at its most beautiful from July to January (wet months). Obviously, don't go there when there is a typhoon as the streams easily turn into raging rivers.